Experience luxurious total body care as we pamper you from head to toe. Our effective and relaxing body treatments are delivered using professional draping techniques so that your modesty is intact throughout your service. 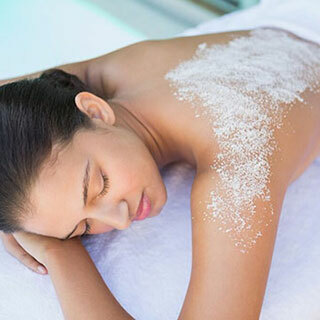 A ONE Salon & Spa body treatment will wrap you in renewing warmth, as your cares and stress melt away. No matter which one you choose, you are sure to feel relaxed and ready to take on your life here in Oak Brook. Mineral rich salts from the Dead Sea blended with Aromatherapy massage oil gently exfoliates leaving skin moist and silky smooth. *Schedule before a massage treatment or on its own. This luxurious body cocktail includes a deep cleansing, invigorating apricot exfoliation, and rich treatment cream of Vitamin A, C, and E. The skin’s tone and elasticity increases and feels soft and velvety.